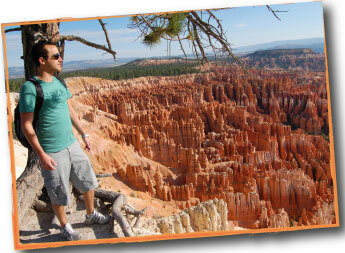 Daily one day Bryce Canyon tours from Las Vegas! . More spectacular than the Grand Canyon! 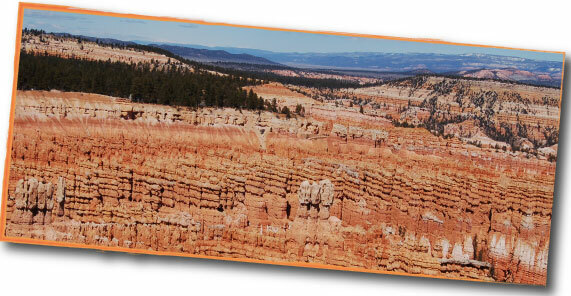 Tour all the main view points at Bryce Canyon, with plenty of time to explore! Plus tour Zion National Park on the same tour. Check out the details. Not only is this the most popular Bryce Canyon tour, it is also the lowest cost, and the only one with departures every day! Please see the complete tour description. 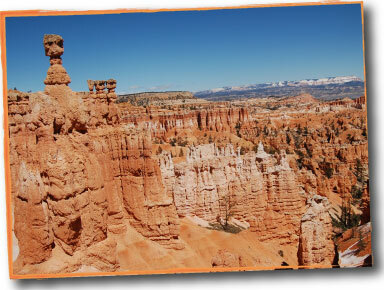 An overnight Bryce Canyon tour is also offered. If you have a group, please consider a private Bryce Canyon tour, from either Las Vegas or Salt Lake City. The Grand Canyon bus, the Bundu Bus, connects Bryce Canyon to five major gateway cities, as well as the great parks of the western USA. You can now also take a Bryce Canyon tour from Salt Lake City. The Best Grand Canyon And More Tour. Three day tour visits Bryce Canyon, the Grand Canyon, Zion, Monument Valley, Antelope Canyon, Navajo Reservation, Horseshoe Bend, Colorado River, Lake Powell, with options of a Grand Canyon helicopter tour and Colorado River rafting. The Best National Parks Tour: Four day tour goes to all the above, plus Arches, Canyonlands, Moab and Capitol Reef.